Some music pulls you into its rhythmic embrace. Other music, like jazz saxophonist Tony Bragano’s collaborative album with guitarist Roberto Restuccia, has legs and it runs and jumps and invites you to come out and play. The aptly titled album, which just released, offers fanciful, brilliant moments that at once relax the soul and capture the frivolity of life. With Escape this duet of guitar and soprano sax proves to be the vessel on a journey to soothe the senses in a fun and exuberant way. Full, rounded melodies marked by smooth beats make up the tracks on Escape. The tunes form a sound that’s much different than the easy, relaxing tunes of Bragano’s album debut, Take It Easy, which was Bragano’s rebellion against society’s relational disconnect. While that album gave listeners permission to relax Escape is an invitation to have some fun. “For Roberto the album really was his Escape at times, a way to relax and have fun and for me it was much the same; a positive and enjoyable way to express myself and share some of that desire to be mindful of the little things that make life so enjoyable,” Bragano said. The overall effect of Escape is that of two friends jamming side by side. In reality the two musicians produced the album without ever meeting face to face. Bragano said he heard Restuccia’s work and asked him to contribute to his songs. Restuccia then asked Bragano to contribute to some of his songs. Eventually, the two musicians decided to create a collaborative album. Without stepping foot into the same studio the musicians each worked on a piece then handed it off to the other for more revisions. “It was like an essay being revised back and forth. I’d write something then he’d add something special, then I’d add something and we’d pass it back and forth that way until it became this beautiful evolution,” Bragano said. 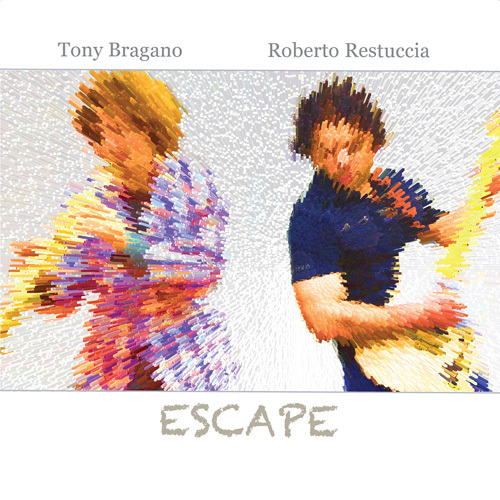 Together Bragano and Restuccia bring a new and exciting sound to Contemporary Jazz. The album is mostly instrumental, but features vocalists Steve Johnson and Sarai Usry on two tracks. Expect a diverse set of songs which offer smooth, soulful, romantic and soothing vibes. Bragano was first introduced to music when he was 14 years old when he used to watch his father play guitar. He persuaded his father to teach him how to play and began exploring a variety of instrumental stuff, but mostly lead guitar work. He then explored piano for a while until the day he was listening to jazz radio and heard the soprano sax. He then made a connection that directed his career. Like Bragano, Restuccia also began playing guitar at 14 years old after discovering guitarist Slash and then Prince. Once he picked up the guitar he virtually never put it down again. He studied at the Academy of Contemporary Music where he was exposed to music theory and harmony while finding inspiration from players like Guthrie Govan and Pete Callard. Through his teaching he’s passed on his enthusiasm for guitar to hundreds of students. More recently he has been active on the internet and YouTube, showcasing his own personal playing style and voice on the instrument and winning two international guitar solo competitions on YouTube.